I scream, you scream, we all scream for....well, you know the rest! It wouldn't be summer without a tribute to ice cream, especially with #NationalIceCreamDay coming up on July 15. In honor of the sweet stuff, we put together this guide to hosting a stress-free ice cream social in your backyard. After all, ice cream parties are an easy, fun and inexpensive way to get everyone together during the warm weather months. So let's get started! Once you've picked a date and sent out invites, it's time to assemble everything you need for your party. The setup: Summertime is the perfect excuse to be carefree, so keep things simple! Do a buffet-style setup with bowls, spoons, napkins, toppings, etc., so kids can make their own sundaes in an assembly line fashion. Add paper tablecloths and balloons in cheery, pastel colors to mimic an old fashioned ice cream parlor. Display a chalk board to welcome guests and announce the day's flavors. The ice cream: Stick to classic flavors like vanilla, chocolate and strawberry since they'll serve as a great base for all the toppings you'll have on hand. Consider adding one carton of a popular "fun" flavor like chocolate chip cookie dough or cookies 'n cream, but don't feel the need to overdo it with options. If you're hosting the party outside, keep your ice cream cartons in an ice-filled cooler to prevent them from melting. The toppings: Fill colorful little bowls with kid-approved toppings like chocolate chips, mini marshmallows, rainbow sprinkles, crushed peanut butter cups and, of course, Go Organically Organic Fruit Snacks. Don't forget the chocolate syrup and whipped cream! 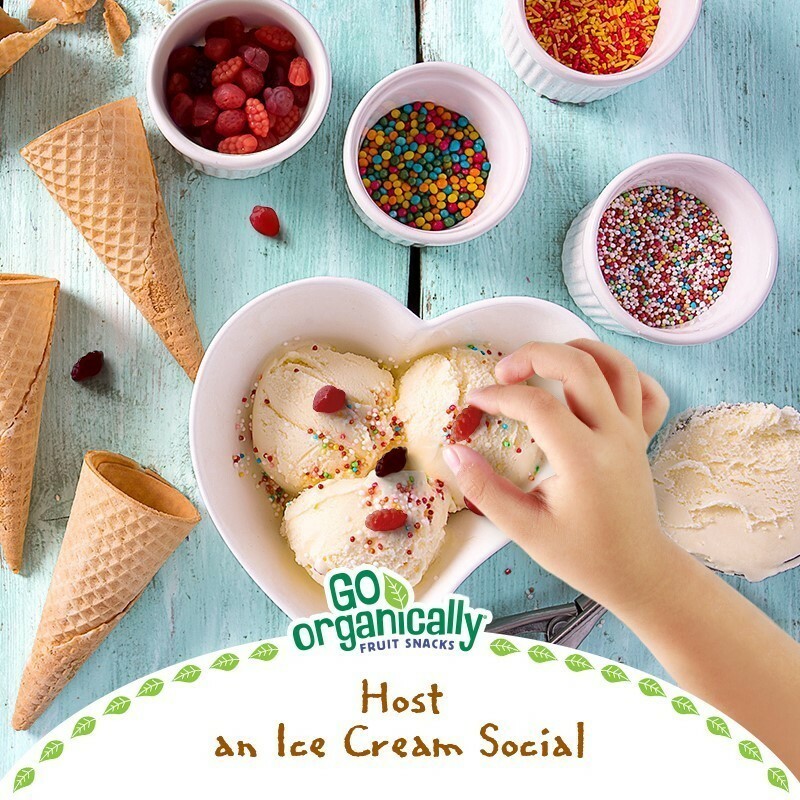 Delight little ones by adding an ice cream-themed game to the agenda. We love "Pin the Cherry on the Sundae"—a riff on the classic party game "Pin the Tail on the Donkey." Draw a picture of a large ice cream sundae on a poster board, or simply print out an oversize photo. Give each kid a construction paper cherry with double-sided tape on the back. One by one you'll blindfold each guest, spin them around, and instruct them to place the cherry as close to the top of the sundae as they can. The guest who places the cherry closest is the winner and gets to make their sundae first. YUM! How? It's easy! Enter to win by using the Giveaway Tools form below. Good luck! My favorite flavor of ice cream is pistachio. My favorite flavor of ice cream is chocolate. Thank you for the fun giveaway. My favorite flavor is anything with chocolate & peanut butter. I love plain old vanilla ice cream! Thanks for the giveaway! I love rum raisin ice cream. I love any flavor with chocolate and peanut butter! In Wisconsin, we love frozen custard. choc chip cookie dough is my favorite. My favorite flavor ice cream is Cookies & Cream. I like vanilla soft serve. Chocolate Marshmallow is the best! Vanilla is my favorite ice cream. I like jamocha almond fudge. I like Neapolitan ice cream. My favorite easy to find ice cream is chocolate chip cookie dough, but my absolute fav is this raspberry cheesecake flavor from a local shop.